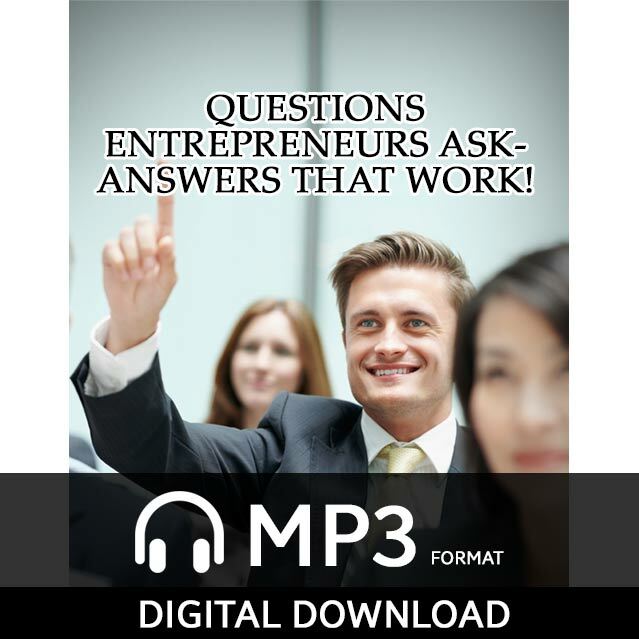 Questions Entrepreneurs Ask-Answers That Work! STRATEGY AFTER STRATEGY ON HOW TO GROW YOUR BUSINESS INTO A SIX FIGURE MONEY MAKING MACHINE AND MORE. This program is designed for those in network marketing who want make their business a success. I developed this program as a guide to track your path to success. Don’t let anyone fool you, being in business certainly has its challenges. It can be even more challenging if you do not have a business background. In order to succeed, you will have to develop a specific mind set. I don’t waste any time getting to the questions in this session. The first question refers to comfort zones. Specifically, how you and your team can move past your comfort zone in order to stretch and take the needed steps that will increase results. You’ll learn the one biggest reason why the retention rate is so low in network marketing and what you can to do control it within your team. Solving this problem alone will allow you to dramatically grow your team. As you work your business you will continue to appreciate the power of copying yourself. Of course you will want to add variations from time to time and always continue to improve. Maybe you find your presentation or scripts could be better. You are now torn between re-inventing the wheel and a new idea that seems profitable. I will share with you how to identify if and when it is time to continue copying yourself or change it up a bit. You’ll learn the distinction between being a leader and being creative. So you’ve applied the concepts we’ve discussed this far and beginning to experience increased success. It seems you are doing everything you should. You attend seminars, track your progress, and believe in your product. Yet no matter how much you fight it, and even though you are reaching your goals, you are beginning to lose motivation. Listen to this segment and I’ll share with you powerful but simple ways to become emotionally consistent. You’ll begin to understand why you are losing motivation and what you can do to prevent this from happening. One of the most financially damaging things about having a home based business is that it’s based at home. It can be very difficult to control the distractions that may be created from your kids, your spouse, household chores, and the dozens of other excuses we can find not to work. This can in turn prevent you from focusing on important parts of your business. I will offer you some very practical tools to take full control of managing your time. You will become more efficient and have greater results. Have you ever been so excited about your opportunity or product that you actually scare a prospect? It sounds funny but it happens! We will gain a balanced view of how we should project information to the potential customer to prevent this from happening. You may know what it feels like to be very excited about your business while at the same time being surrounded by friends and family who are very negative. You are human, and if you’re not careful this will bring you down. You certainly can not move into a hotel and run away from the negativity (though at times it may sound appealing!). I will offer you some solutions that will make you bullet proof to negativity. If you can prevent yourself from being controlled by this negativity you will be able to keep moving forward. Many people who are considering network marketing and even those who are currently involved may wonder if it really matters what product you are selling or promoting. The answer is two-fold and might surprise you. The answer behind this question will ultimately determine your success. You’ll here a lady in this session ask a question that might make us both feel pretty fortunate. She is over $200,000 in debt and needs some serious advice about her business. You will gain great insight on managing your money and business listening to this conversation. Have you been around people that are totally disorganized? For a successful business to run efficiently it must have systems in place that create organization. Disorganization often leads to procrastination and frustration. I’ll share with you some awesome hints that will keep things simple and stomp out procrastination. An inexperienced person getting started with networking marketing will often have unrealistic expectations. Unfortunately, some join the network marketing industry with a get rich quick mentality. If you don’t figure out who these people are and what traits the have that manifest this negative quality, they won’t be around long. I’ll give you advice on how to identify them and how to change their mind set and not expect results immediate results with little or no effort. There is a principle that many have heard about when it comes to getting results. It basically says that we spend 80 percent of our time getting 20 percent results. If you could double that 20 percent we would double our results. I am going to share some ways in how to manage our results better. You’ll love these result driven ideas. If you or someone you know has a challenge with calling people or approaching people, the problem often stems from a negative association of some kind. If this association doesn’t change you will find yourself fighting to improve without seeing actual change. I will share with you a very powerful technique on how to change this association. All it takes is a paper and pen and you will be on your way to a simple approach to pushing through limitations.